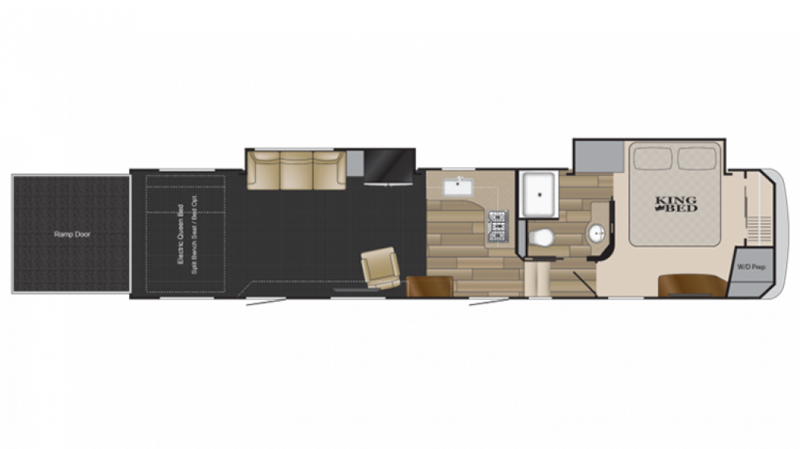 Travel anywhere in stylish comfort with the 2018 Heartland Road Warrior RW411 5th Wheel Toy Hauler! National RV Detroit is a top, full service RV dealership in Belleville, Michigan. Our dedication to providing top-notch sales and service to our customers has made us a success in this state and beyond, ever since we opened our doors in 2008. We offer all the top brand RVs at wholesale prices with great financing that can fit any budget! So stop in today and let us put you in the RV of your dreams! We're conveniently located at 44700 N I 94 Service Dr Belleville Michigan 48111 and we're ready to make your RV dream come true! 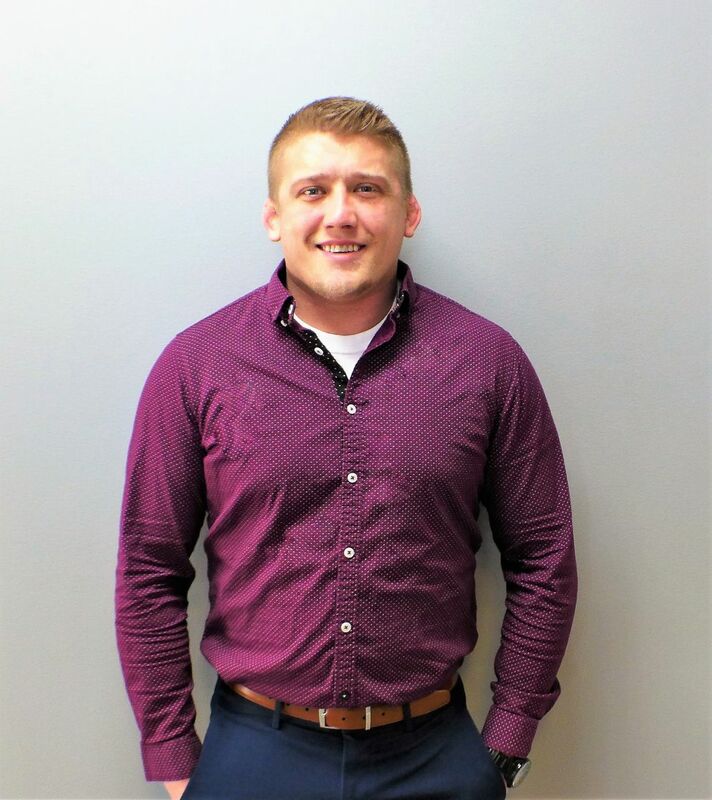 Even if you don't live near Belleville or the Detroit area, we can still help you thanks to our personalized phone and internet service, and our 24/7 delivery service that covers all of North America! There's comfy living inside this 41' 6" long, 8' 5" wide 5th Wheel Toy Hauler, especially with its 2 slides that maximize the interior space. It's 13' 3" high, so you can stand up, walk around and stretch out! And no matter how bad the weather outside, the modern 15000 BTU a/c unit and efficient 35000 BTU furnace will keep the climate inside comfy and pleasant! 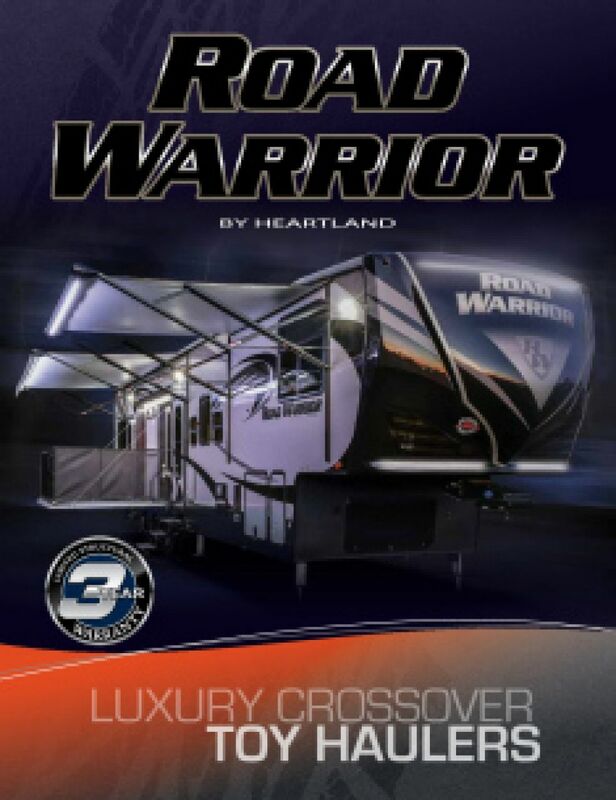 When the sun goes down and it's time to hit the hay, you'll be glad you're camping in the Heartland Road Warrior RW411. It sleeps up to 6 people and has a beautiful and comfortable master bedroom! In the spacious King bed, you'll enjoy a great night's slumber after every fun-packed day! The kitchen is fully equipped with modern cooking appliances, so healthy, hearty meals are always within reach! Store your fresh foods in the 18.00 cu. ft. refrigerator, then cook them up on the sizzlin' 3 burner range cooktop! Fill up the 110 gallon freshwater tank for an abundance of clean water throughout your trip! You'll no longer have to deal with the cold, damp campground restroom! This RV's bathroom has a shower and a Foot Flush toilet, with used water and waste stored in the 82 gallon gray water tank and the 41 gallon black water tank, respectively! 60 lbs. of LP tank capacity keep the shower nice and hot! Haul your toys straight to the campground in the garage, which has a length of 22' 0"! This toy hauler's cargo capacity of 5551 lbs. makes it easy to ship your biggest, heaviest toys!